The University of Oxford Mathematical Institute keeps an electronic copy of this thesis. The deregulation of regional electricity markets has led to more competitive prices but also higher uncertainty in the future electricity price development. Most markets exhibit high volatilities and occasional distinctive price spikes, which results in demand for derivative products which protect the holder against high prices. A good understanding of the stochastic price dynamics is required for the purposes of risk management and pricing derivatives. 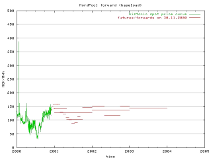 In this thesis we examine a simple spot price model which is the exponential of the sum of an Ornstein-Uhlenbeck and an independent pure jump process. We derive the moment generating function as well as various approximations to the probability density function of the logarithm of this spot price process at maturity T. With some restrictions on the set of possible martingale measures we show that the risk neutral dynamics remains within the class of considered models and hence we are able to calibrate the model to the observed forward curve and present semi-analytic formulas for premia of path-independent options as well as approximations to call and put options on forward contracts with and without a delivery period. 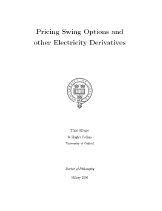 In order to price path-dependent options with multiple exercise rights like swing contracts a grid method is utilised which in turn uses approximations to the conditional density of the spot process. Further contributions of this thesis include a short discussion of interpolation methods to generate a continuous forward curve based on the forward contracts with delivery periods observed in the market, and an investigation into optimal martingale measures in incomplete markets. In particular we present known results of q-optimal martingale measures in the setting of a stochastic volatility model and give a first indication of how to determine the q-optimal measure for q=0 in an exponential Ornstein-Uhlenbeck model consistent with a given forward curve. Below is a short animation of the dynamics of the Norwegian electricity spot and forward market.